HomeGlobal News2015 > Let's Go Blues! If you saw the St. Louis Blues’ 2015-16 home opener Thursday night, you may have noticed a familiar face with a new role in the lineup. As part of this year's campaign to increase visibility and awareness during its centennial year, Webster has enhanced its partnership with the National Hockey League club to make sure Webster is noticed by TV viewers across North America and around the globe. In addition to continuing the Centennial-style “What Year?” in-game history trivia on the center ice scoreboard, as well as a dynamic “rink wrap” graphics on the ribbon that wraps around the arena, this year Webster's logo will appear at ice level on a digital dasher board ad that is new to Blues games this season. This means Webster is seen not only by the 18,000 fans who watch each game in person, but also the thousands who watch live NHL hockey and highlights across North America and around the globe. As just one example, Thursday's game drew the attention of millions of hockey fans throughout North American and the world because it was the professional debut of Connor McDavid, expected to be the best player in a generation. The trivia and rink wrap will feature at 10 games this season, while the dasher board ad – seen by 18,000 fans at each game as well as in live coverage and highlights broadcast around the world – will be a part of all 41 home games. 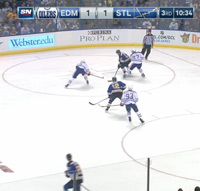 “The Blues have one of the highest-rated TV viewerships in the NHL, so we are excited that this exposure reinforces Webster’s brand in the St. Louis region and broadens it to hockey fans watching in markets across the U.S., Canada and the many hockey fans who follow the NHL around the world,” said John Costello, director of Creative Services in Global Marketing & Communications. This season’s scoreboard trivia also has an extra punch designed to resonate with Blues fans: It closes with an emphatic version of the traditional Blues chant, “Let’s Go Blues!” delivered by the students who formed the “W” on the Quad during Orientation.